I saw this top map on Facebook. I can't verify its accuracy. I also won't debate whether a particular State is "better" than some other State. Are they based on "taxation" and coercion? That's all I need to know. What that map does make me think of is another map, concerning someone else who was in a place first (and, no, no one was in either of these places in "the beginning", but migrated there at some point) and lost their land/property and freedom to someone else who decided that god had given the land to them, because of their obvious superiority and because they won god's favor. Or something. It just doesn't smell right to me, in either case. Of course, it wouldn't be an issue at all without governments behind it. People should be free to keep their property, or sell or trade it, to anyone for any reason. People should also be free to use any means at their disposal to defend their property from those who want to steal it. Neither of the illustrations show consensual property redistribution, but theft and aggression. And no one should ever be subject to some government or its "laws" simply because of where they live or because of who outnumbers them. As to Isreal and The Palestine: The Arabs say the Isrealis forced the Palestinians out of Palestine when Isreal became a nation. The Isrealis say that is not true, but rather urged them to stay. The Jews that migrated to The Palestine before 1948, took bad land and turned it into fruitful farms. The Palestinians who weren't shopkeepers, were basiscally serfs to the Arab landowners. From my study of the history of The Palestine, now Isreal, I believe the Isreali side of the story. The Arab leaders told the Palestinians to leave so the Arab armies could kill all the Jews, then the Palestinians could come back, re-claim their property as well as the property of the Jews. 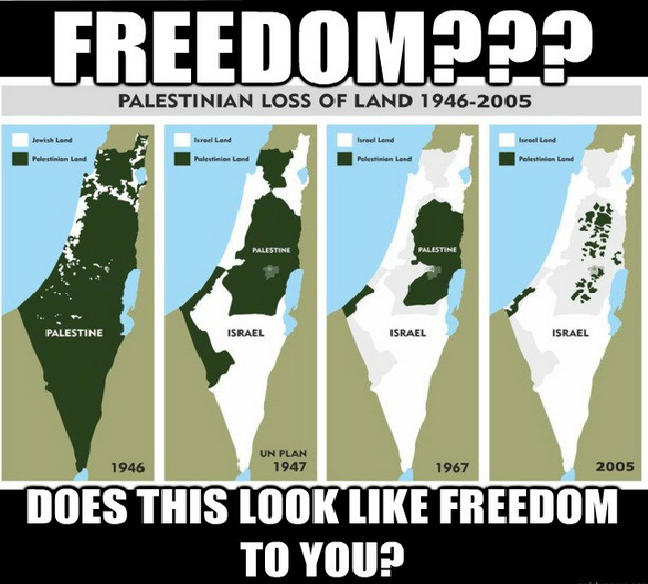 The Palestinians have no one to blame but themselves. As to the original inhabitants of America: As with the long history of Europe and Asia, groups of peoples will via for territory and resources. The winners set the rules and the losers must move, integrate, or die. Also, the Indians, some of the tribes, were conquering tribes also, like the Aztecs. Cortez, when he went back to Tenochtitlan, had thousands of Indian allies from the tribes that the Aztecs had conquered. Had the Europeans not shown up, the Aztecs might have conquered and ruled all of what we call Mexico. How would that have been any different from what the Europeans did? Once again, it gets back to land changing hands non-consensually through aggression. Just because "they did it, too" doesn't mean it is right. That wasn't my point, Kent. What I was saying that it is human nature, all human nature, to use force to get what they want. For instance, "Thou shalt not kill" of the Ten Commandments was only meant to apply to the Isrealites among themselves. Other nations and tribes were fair game. It takes an educated and enlightened population, one that believes that each person has a right to the ownership of himself or herself and any property they can honestly and peacefully accrue: A Libertarian populace. And that's not likely to happen.